I think some of us, at one point in our lives, suffered from shoulder pain. It is relatively common and has a variety of causes, from a simple muscle pull to a dislocated joint. The reason why is that the shoulder has the most range of motion of any joint in the body and it could simply be caused by a heavy shoulder bag. Our question is: are you traveling soon, or you simply want a bag that’s comfortable, lightweight and stylish? You are interested in buying one of the best travel shoulder bags, but you have no idea what to choose? We got you covered. We made a list for you where you will find all the good and bad stuff about the best travel shoulder bags, such as what they are made of, how you can use it and what for, the sizes and colors they came in, how big or small they are, what you can put in them and where you can find them. This way we hope your decision will be easier to make. We prepared for you the 5 best shoulder bags that are suitable not only for traveling but also for school, outdoor activities such as walks in the park, nights out with friends and family, beach days and for parents on the go. 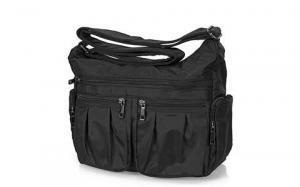 This bag from Leaper it is great not only because it comes at a reasonable price, this bag offers you true comfort. The material that’s made of it’s soft and durable Washed Canvas with PU Leather Decoration and it’s perfect for people that love animals because the details were made to look and feel like leather but without using animal skin. The outside material is durable, and the inside is softer. It combines vintage style with classic accents and that combined offers a more modern style that anyone can love and appreciate and the fact that it has a lot of pockets can be an advantage too. The colors that this bag comes in are also beautiful. They are nothing too strong, they are neutral and can be used by both men and women, adult or children. The buckles on the top flap open and close easily and keeps everything safe, it can, without a problem, hold a change of clothes, toiletry items, small gadgets or you can use it as a carry-on bag for plane travel. It is not water resistant, but it can be carried out for outdoor activities, such as running or camping. And because you can alternate the strap from a side to another that represents a benefit. Comfortability! And if you think this bag is not for you but still like what it can offer, it can make a great gift for your friends and family. If you are a person who likes to go camping or hiking, or simply need a bag nor too small or too big this is the perfect one for you! Berchirly created a bag that’s made of durable canvas and high-quality faux leather decoration that offers great comfort, durability, and elegance. It has 1 main pocket, 1 open slot under flap, 1 front zipper pocket and 1 rear zipper pocket for you to organize your stuff and the best feature is it's expandable using a zipper around the perimeter which doubles the volume. It can, without a problem, fit in your wallet, keys, phone, and other small items. It has an adjustable shoulder strap and it can be used as a shoulder bag or crossbody by both men and women regardless of their age. Also, it has a reasonable price, comes in 3 sizes, the colors are pretty and give you a vintage vibe! The outer flap quick Velcro is convenient for casual use and inner zipper closure to secure your items without a problem. 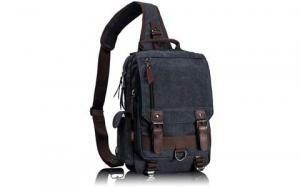 The fact that this bag is made of durable canvas and faux leather is that it offers great sturdiness, is flexible, tough and comfortable and the faux leather is very durable, and it will last longer. When traveling, shopping, taking part in activities safety is always a concern. That’s why this bag is one of the best. Although it may be considered small, this well-designed bag holds a lot! Even if it’s filled, it is very lightweight in comparison with other bags. It has a variety of pockets which makes finding things very easy and because it has an adjustable shoulder strap that’s slash resistant and blocks thieves to go from stealing it when you attach it to a chair makes this bag one of the best. Also, the RFID blocking pockets protect you against electronic pickpockets and identity thieves! The strap and lower part of the bag body are strengthened with panels made from flexible stainless-steel chain-link mesh making it firm and durable. The bag is conceived from polyester which is a lightweight material that is more resistant to UV radiation than others and has a very high melting point, meaning it can tolerate a long-drawn exposure to the sun without the material wearing out, but unfortunately it doesn't float, so make sure it stays away from water. The inside of the bag is illuminated by a removable LED light to help you find your valuable items more easily. You can choose the color, be it bright red or any other color. The decision is yours. It comes in many colors. That way you can choose the one you like; the colors are designed to complement almost every outfit. 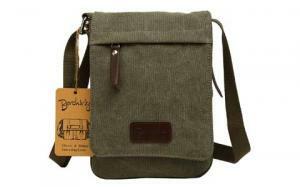 This bag is perfect for traveling, shopping, camping or everyday use. This shoulder bag is perfect for casual outings. With his modern design and organized storage, you will have room for your phone, wallet, and gadgets. And if you are an active parent and you are on the go you can easily fit in a change of clothes, food for the baby and toys. Its material is high-quality nylon fabric with fabric lining, sturdy, lightweight, durable and the best part? It’s waterproof! Also, when it comes to strength, nothing beats nylon. It's strong, durable and comfortable. We all know that nylon has the ability to stretch without breaking and it can return to its original form. And because it’s lightweight it won’t cause you additional pain to your neck or shoulder. It has enough space for you to put your things in. It has 1 main bag, 3 front bags, 1 back bag, 2 beside pockets, 1 inside pocket and 2 inside card and phone holder. It may not be fancy or super expensive but it's attractive and functional. You will want one in every color! This bag is everything you need. It’s lightweight but it has plenty of room in it for you to carry any essentials you may need for a day out. The secure zippers will keep your personal belongings safe. It is made of cotton canvas, smooth polyester cloth material lining, very soft in touch making the bag comfortable and durable. 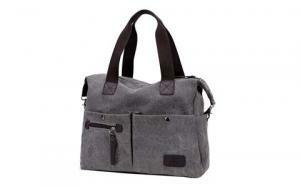 The combination of cotton canvas and polyester makes the bag strong and more UV resistant. It’s not waterproof but it has water resistance properties. 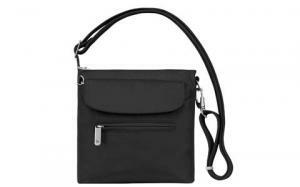 It has a multitude of pockets and every bag has a removable and adjustable strap. That way you can use it either as a shoulder bag, cross body bag or as a handbag. The colors are beautiful, nothing too bright. It can easily complement your outfit on a day out. Also, it can be a wonderful gift if your friends or family members are active and need a bag that has a lot of space. And if you are wondering how to maintain the bag, it is easy: you wash it with clean water at a normal temperature, not too hot nor too cold, and hang it to dry in a ventilated place! There are many reasons why everyone should own at least one shoulder bag. Even though you might store it in your closet and use it once in a while or even every day, having the option to choose is great. When having a bag that you can use at any given time, that makes you feel comfortable by eliminating the additional neck and shoulder pain and the need to search for accommodation every time. Buying a bag that can be used either as a handbag, shoulder bag or cross-body bag can be challenging because of a large number of options out there, as well as the price differences. The five products in our list are affordable and suitable for anyone’s needs.